Lunch is always a difficult meal for me to get inspired about. Midday, I want something light yet filling, fresh and satisfying that will last me through the afternoon. Salads are always a good go-to lunch option but most are uninteresting and ultimately unhealthy, which completely defeats the purpose of eating a salad in the first place. This salad is not one of those—it is flavorful, healthy and a lunch you'll be excited to dive into! This Tortilla Chip Chicken Salad with Jalapeño Lime Dressing is sweet and spicy, packed with flavor and texture and a whole lot of crunch. Plus, it contains two of my very favorite foods: avocados and mangos. 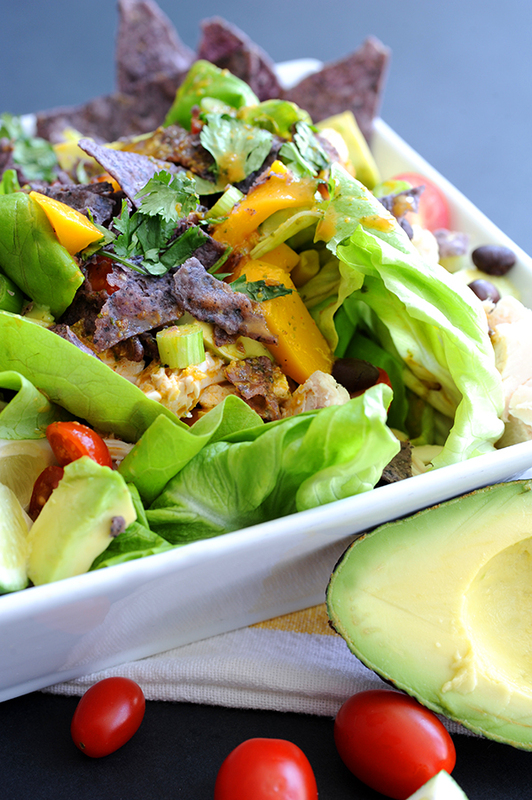 The Jalapeño Lime Dressing is what really takes this salad to the next level. It is spicy and satisfying and I kind of want to use it on everything. 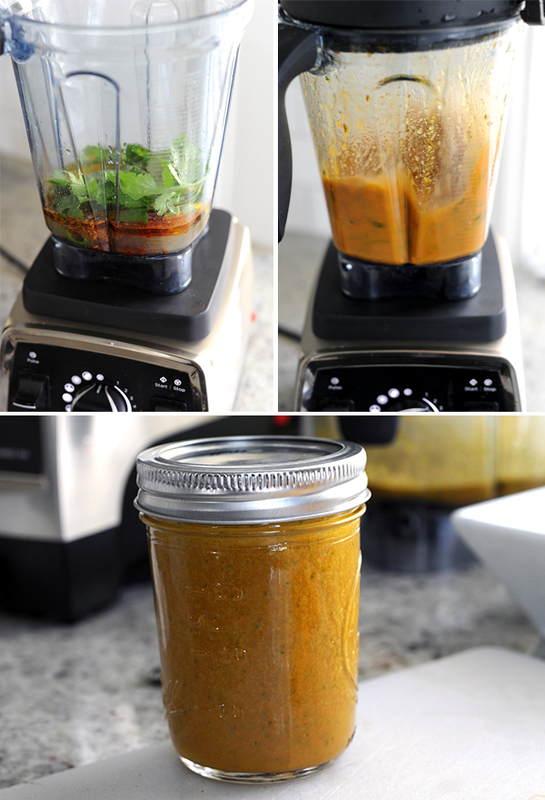 The dressing is really simple to make in the blender. To make the dressing, place all the ingredients in a blender and blend until smooth. Taste and season with salt and pepper. Place in a mason jar and store in refrigerator. 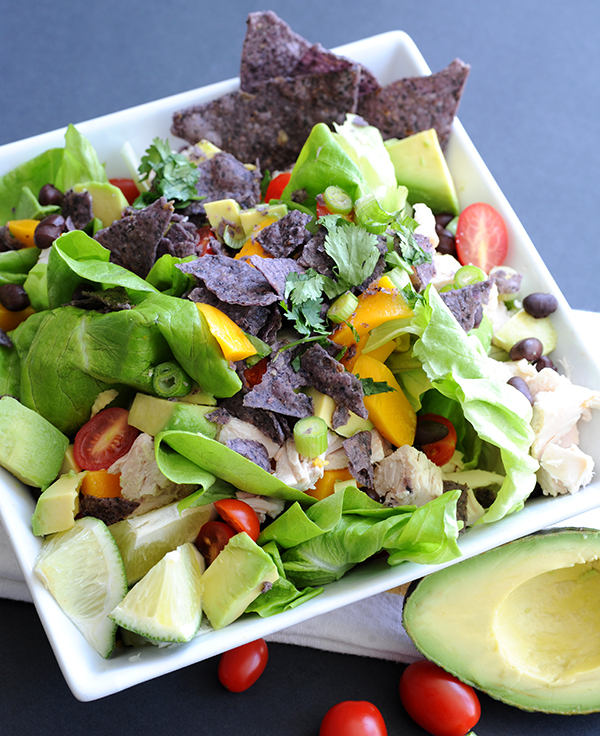 To assemble the salads, combine lettuce, black beans, corn, tomatoes, mango, avocado and chicken in bowls or on plates. Top with dressing, tortilla chips, green onions and cilantro. I love to double the salad dressing recipe to keep a jar of it in the refrigerator. It's not only perfect on top of salads but makes a great marinade. I used it last night to marinade halibut for dinner. This dinner is really fresh and healthy. I just marinaded the halibut for 15 minutes and then threw it into a pipping hot skillet, flipped once, and let cook until flakey (only 5-7 mins). I served with fresh avocado, rice and a mango, black bean salsa (made from left over salad ingredients—mango, grape tomatoes, black beans, cilantro, lime juice, salt and pepper).